On 21 April, 6:30pm at Asia House, we turned our attention to the Far East in our lecture Blazing Guns and Noble Swords: The Spectacle of Samurai Masculinity. Dr Doreen Mueller, Senior Teaching Fellow at the School of Oriental and African Studies (SOAS) addressed how swords and guns were envisioned in the popular imagination in early modern Japan. 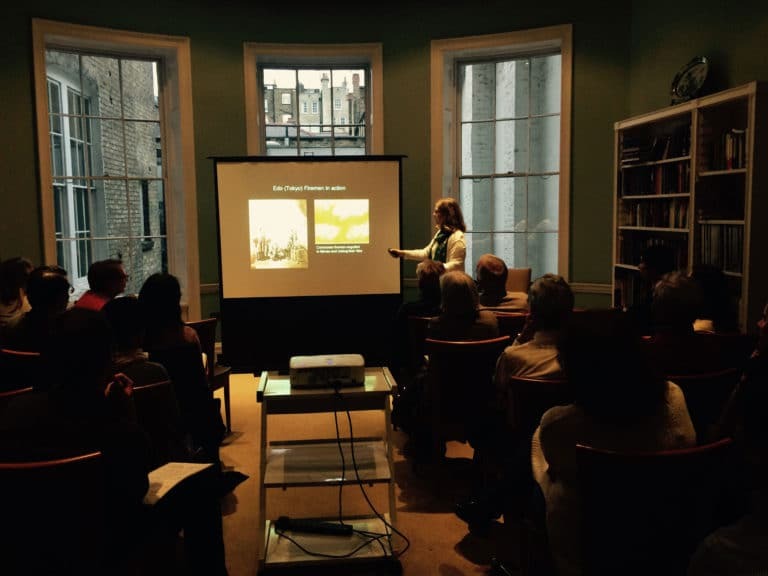 Dr Mueller delivered her engaging lecture to a packed audience at Asia House. She explored the rich popular visual culture that engendered the creative reimagining of swords and guns as tokens of samurai masculinity. Dr Mueller focused on the late Edo period, Nineteenth Century, using the printed book Illustrated Guide to the Secrets of the Military Arts from 1855 as a starting point. A fantastic range of imagery was used to accompany the lecture such as depictions of armour, the ‘naked’ sword to the adorned sword, as well as stunning imagery from illustrated manuscripts and woodblock prints. We’ll address martial arts again but from a different context on 19 May, 6:30pm at the the Asia House library with our lecture Rise of the ‘Jujitsu-Suffragettes’: Martial Arts in fin-de-siècle Great Britain. Join us as Dr Emelyne Godfrey will explore the blossoming of martial arts in Great Britain at the turn of the 20th century; experts from Japan taught politicians, the public and police alike the art of jujitsu and women sensationally took up jujitsu in the campaign for women’s suffrage.